Mangaluru, 25 June 2015: The first parcel of “MangaPol” polypropylene pearls will be flaged off from Mangalore Refinery and Petrochemicals Ltd (MRPL) on 25 June 2015 by Pralhad Joshi, MP & Chairman standing committee of Ministry of Petroliam and Natural Gas. MRPL recently started commercial production at its new 440,000 tonne/year polypropylene (PP) plant and it is another mile stone in the history of MRPL. The flaging off function will be held at MRPL at 3pm on thursady and MP Nalin Kumar Kateel, MLC Ganesh Karnic, Ivan D’ Souza, Monappa Bhandary andMLA Moideen Bava will be the chief guests. 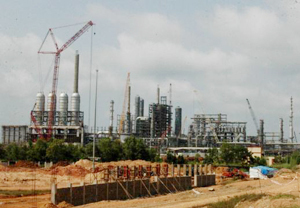 The plant at Mangalore is part of the company’s phase III refinery expansion and upgrade project. It uses the process technology of German firm Novolen and will get supply of feedstock propylene from MRPL’s upstream petrochemical fluidised catalytic cracking unit (PFCCU). MRPL spent Rs1,803 crore ($282m) to build the new PP plant, which is integrated into the refinery, ensuring security of feedstock supply.